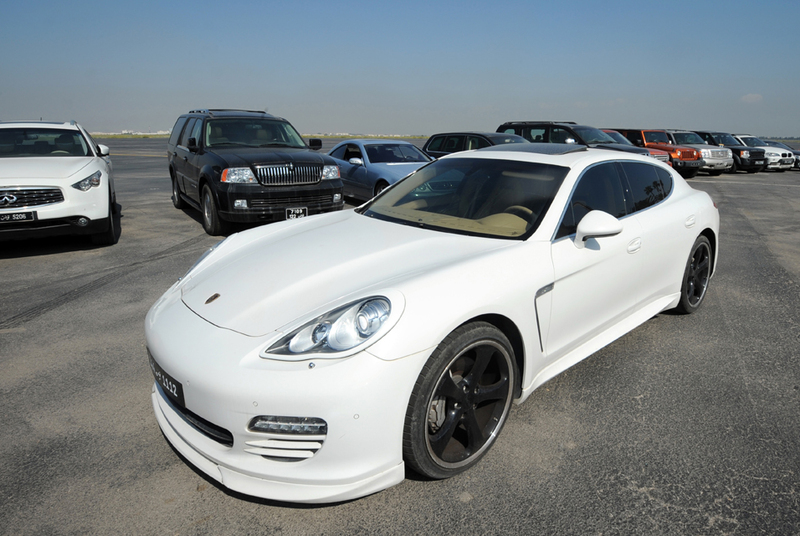 A Porsche belonging to a daughter of Tunisia's deposed ruler Zine El Abidine Ben Ali, is seen parked in the grounds of the National Guard barracks in the capital Tunis on October 5, 2012. Tunisia said it will begin an auction on December 23, 2012 of thousands of works of art and luxury cars that once belonged to the family of ousted dictator Zine El Abidine Ali, hoping to raise millions of euros. AFP PHOTO / FETHI BELAID. TUNIS (AFP).- Tunisia said it will begin an auction on Sunday of thousands of works of art and luxury cars that once belonged to the family of ousted dictator Zine El Abidine Ali, hoping to raise millions of euros. Highlight of the month-long sale is expected to be the former president's cars, which include a Lamborghini Gallardo LP 460, a Bentley Continental sports car, an armoured Cadillac and a Maybach 62. Acting finance minister Slim Besbes told reporters that items valued at less than 10,000 dinars (5,000 euros) would be sold at fixed price, but that anything priced above that would be sold to the highest bidder. The government hopes to raise at least 10 million euros from the sale. Three hundred jewellery items, carpets, tables, televisions and computers will be put on sale to the public at a hotel in Gammarth, a suburb of Tunis. Besbes said the items belonged to Ben Ali and 114 of his relatives. "Except (citizens) of Israel, the sale is open to everyone," Besbes said, adding that a maximum of 500 would-be buyers would be allowed to view the sale items each day. A 30 dinar (15 euro) entry charge will be levied, a stiff amount in a country where the minimum wage is just 320 dinars a month. Besbes said the auction would be held under tight security, with naval ships to be deployed off the seaside hotel. Ben Ali, who fled in the face of the first of last year's Arab Spring uprisings, lives in exile in Saudi Arabia with his wife. His overthrow has done little, however, to address the economic grievances that fuelled the revolt, with protests against the new government multiplying in recent weeks.